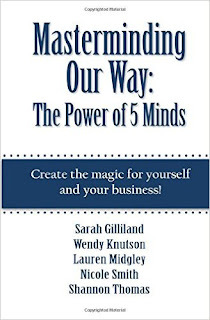 Lauren Midgley, speaker, author and founder of Courage to Succeed Consulting has co-authored the book Masterminding Our Way: The Power of 5 Minds. 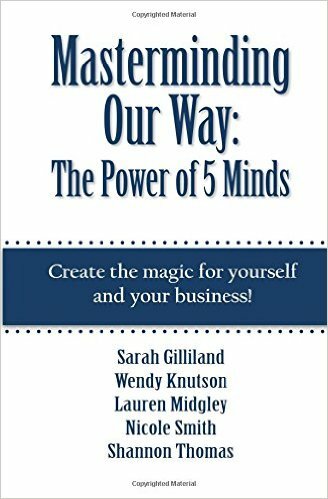 She along with four other brilliant business professionals share their stories on masterminding and how it helps them grow their business and get support in their personal life. When I was growing Back of the Room Productions, I was part of two small masterminds and loved learning marketing and business development strategies as well as gaining insight on who to balance my work and home life. Today, I am part of a mastermind with my business coach Katrina Sawa, and while it is a virtual meeting, I still gain the support I need to improve my business practices. It helps knowing that someone else is there to validate your actions, answer questions, help you solve challenges, or provide an alternatives to processes that haven't been working. Great job on the book, Lauren! Congratulations to you, Sarah Gilliland, Wendy Knutson, Nicole Smith and Shannon Thomas! Go buy the book!